The following instructions will help you provide more detailed diagnostic information after Rocket League crashes or hangs. 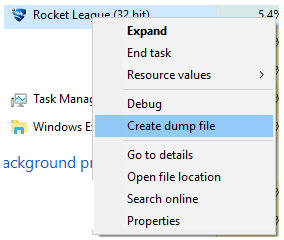 In Task Manager, find the Rocket League executable (Rocket League 32 bit), right click on the process and select ‘Create Dump File’. Once you've found the .dmp file, you can upload it to a media hosting site like dropbox, one drive, google docs, etc. Then please send the file(s) so I can hand them off to our QA team. I have been having this problem however the problem with doing these steps is that it crashes to the point were I can't do anything but Ctrl,Alt,Delete then sign out. I would love to give you dump files but it would be to no affect as it has to happen as its crashing. Cerbzz wrote: I have been having this problem however the problem with doing these steps is that it crashes to the point were I can't do anything but Ctrl,Alt,Delete then sign out. I would love to give you dump files but it would be to no affect as it has to happen as its crashing. 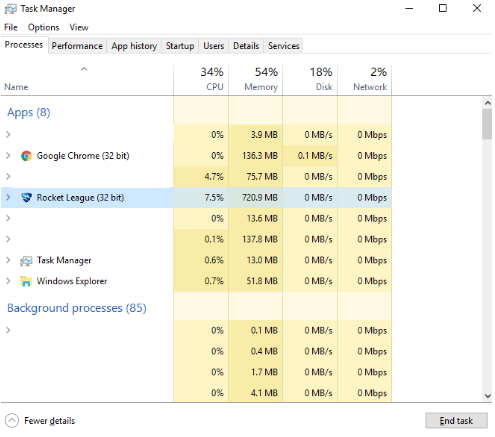 I understand that the task manager will not always appear, however if you have a second monitor you can alt-tab to task manager and then hold the windows button and use the arrow keys to direct the task manager to an area where Rocket League is not present. Ok so I've posted a thread about it yesterday but I'm awaiting aproval for it to be posted, now my issue is where my game won't launch, I reinstalled it and everything, I got all those packages required for the game, all I did is before that I Updated my AMD Driver to another stable version of driver that is pretty new, all the games work perfectly except rocket league where it wont open no matter what, I've tryed everything I found on net, nothing helped, any solution for that, or do I really need to downgrade my AMD Driver? 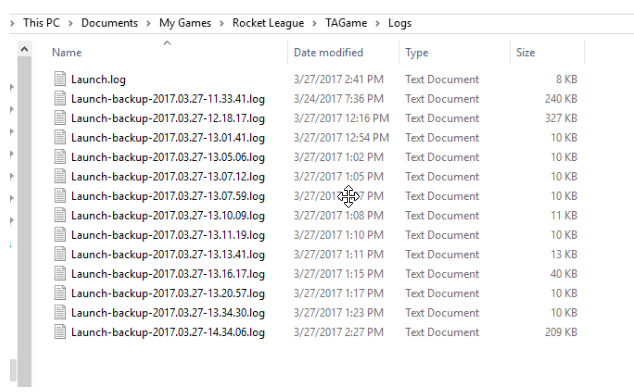 These are my dump files , I managed to get them as when I launch the game I can see if for few seconds in task manager but then it dissapears, so I managed to get that dump file (I Used dropbox for uploading): https://www.dropbox.com/s/yfvu4c8nftijh ... e.DMP?dl=0 P.S Just tryed to downgrade to my original 17.2 driver of AMD, and same thing happens, it won't open, so it's not AMD Drivers at all as all the other games still works normal. Cannot connect to the rocket league server today. Yesterday i was able to, but i had no ping and no rank showing in the ladder. edit:I don't know what you did but today i have no trouble of connection, everything seem's fixed on my side(except a little controller issue). Congratz. 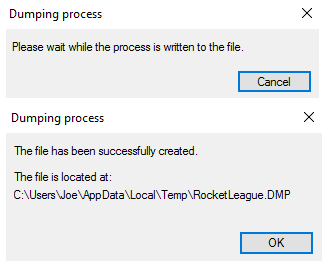 Does the dmp file have to be created while the game is crashing, IOW, while the MS popup is still on screen, or is a dmp file from the next restart sufficient? Is there a way to make it automatically create dmp files for every crash? It would be a good idea for Psi to create a built in utility for uploading this stuff automatically, and just let people opt out of it in options if they don't like uploading stuff for security reasons. what to do if crash with no error? just complete CTD?